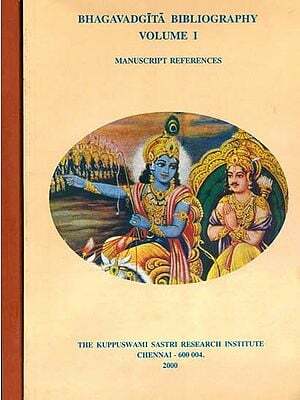 The Second book in the series of K.S.R.I Yoga Granthamala is the present edition of the text Advaya Tarakopanisat, along with English translation and Roman transliteration. Explanation of terms and concepts are also provided wherever necessary . The institute has been seriously engaged in the Sanskrit and Indological Research for more than six decades now. There has been articles written in the Journal of Oriental Research dealing with Yoga. However, no single text was published or translate for a long time. From 2006, the Institute took upon itself the task of bringing out Yoga texts with translation and notes and fervently hopes to publish them as a series. The ATU deals exclusively with the means to achieve Rajayoga, the means being Taraka Yoga. This leads to the experience of Brahman, who is non-dual. Hence the title of the text Advaya Taraka Upanisat. This book is the result of the joint efforts of my colleagues Dr.K.S. Balasubramanian, a specialist in the field of Yogic studies and Dr. T.V. Vasudeva, an Advaita scholar (both Deputy Directors of the Institute). They plan to bring out some more minor texts on Yoga. The present publication is made possible by the financial assistance rendered by Sri S. Krishnamurthy and Smt. Kamala Krishnamurthy, in memory of Svargiya Acaryasevaratnam Sri G.R.Nataraja Aiyar. The Institute is deeply indebted to them for their kind gesture. The academic staff of the Institute – Mrs. R. Subasri, Mr. V. Ramakrishnan and Mr. S.N. Krishna have assisted the editorial committee in proof reading the text. The study and practice of Yoga has gained momentum around the globe. Many texts on Yoga, apart from the popular Patanjali’s, Yogasutras have been brought out by many scholars and practitioners of Yoga. Various research studies have been conducted on the benefits of Yogic practices and results have shown that if these are practised under competent teachers, one can derive physiological and phychological benefits. However, more research has to be undertaken in this direction and hence there is a need for bringing out more original Yoga texts. We have already brought out the Darsanopanisat with Roman transliteration, English translation and notes to help the students and practitioners of Yoga. The present book Advaya Taraka Upanisat (ATU) is the first in the alphabetical order among the twenty ‘Yoga Upanisats’, published by the Adyar Library and Research Centre and also by others. This is a small text consisting of eighteen passages, both in prose and verse form. According to Upanisat Brahma Yogin, who has commented on one hundred and eight Upanisats, this text belongs to Sukla Yajur Veda and expounds the means to achieve ‘Raja Yoga’. Since it teaches the means, viz. Taraka Yoga leading to the experience of ‘non-dual Brahman’, it is aptly named ‘Advaya Taraka Upanisat’. The word taraka suggests that it helps the practitioner to cross the ocean of births and deaths. The Amanaska Yoga ascribed to the legendary saint Goraksanatha, describes Taraka Yoga elaborately. It seems that ATU has borrowed the ideas from Amanaska Yoga in its definition and description of two-fold devision of Taraka. The Mandalabrahmana Upanisat one of the ‘Yoga Upanisats’ also describes Taraka Yoga in the same way, besides dealing with other topics. The texts on Hatha Yoga and Raja Yoga do not give prominence to the practice of Taraka Yoga and hence the students of Yoga would find this text interesting and useful. The Hatha Yoga Pradipika makes a passing reference to Taraka. ATU deals with three-fold laksya, or object of meditation, namely, external, intermediary and internal. While dealing with the intermediary object of meditation, it gives valuable information on the five-fold akasa. (vyomapancakam). Among the texts on Yoga, Goraksa Samhita mentions the term vyomapancakam, but does not describe the five akasas individually. Again this Upanisat follows the description of two-fold forms of Taraka – (i) with form (murti taraka) and (ii) without form (amurti taraka); the latter is known as amanaska. The definition of Sambhavi mudra found in ATU (12) is similar to that given in popular Hatha Yoga texts. Sambhavi mudra is supposed to be highly efficacious and hence the most sacred among the Yogic practices. Generally the texts on Hatha Yoga describe the practice of this mudra in the same way as giving equal importance to the awareness of both external and inner object. That is, one should be conscious of his inner Self, though his vision rests on the external objects. This state can also be called as sahaja samadhi, where one is in the state of external awareness and inner absorption. But ATU hints that the reverse should also be practiced. This text finally emphasises the need for a competent guru by describing the characteristics of acarya and guru, which are well-known. 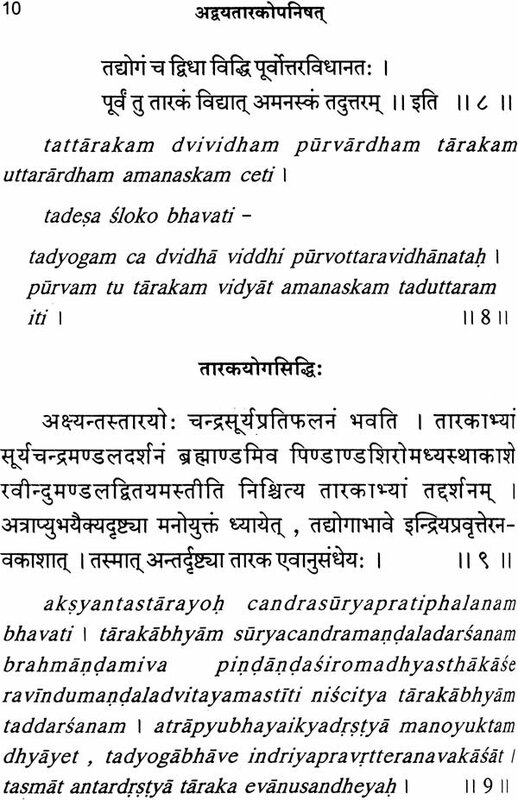 True to its name, this Upanisat says that the practice of Taraka Yoga leads one to the experience of non-dual Brahman. It says (v.3) that since this makes one to cross the ocean of births and deaths. It is known as Taraka. 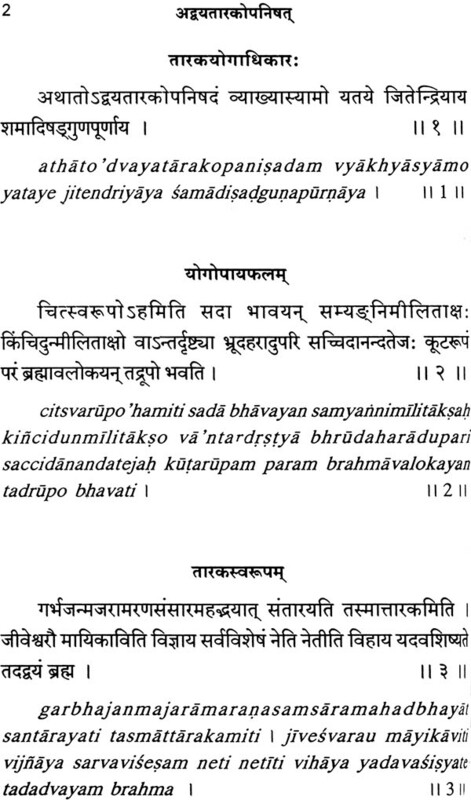 Following the basic tenets of Advaita Vedanta, this Upanisat instructs that it is due to maya that one differentiate jiva from Brahman and one should disregard all the attributes through the method ‘neti neti’ (not this, not this). Finally what remains is Brahman. It may also be mentioned here that even though this is a small text, it poses considerable problems in proper understanding of the sentences. The commentary of Upanisat Brahma Yogi also does not come to our rescue. We have tried to bring out the essence of the statements given in the text. We hope that this book, which is different from the texts on Hatha, Raja, Mantra and Laya Yoga in the treatment of the subject and also in its description of the practices which are often obscure, would be received well by the students and researchers in Yoga.